Thank you all so much for being a part of my wedding day. I appreciate all of your time and care in helping to make me (and my lovely ladies) look our best! 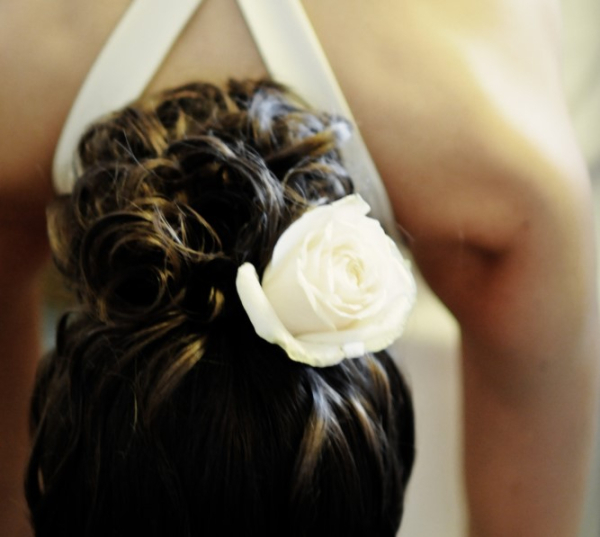 Everyone loved their hair style... and.... they lasted beautifully through the whole wedding day! In particular, I not only loved my style, but it lasted through the day and three different hairpiece/looks. It was so versatile and allowed for me to truly transform through my wedding day. Thank you again, so much!" ~ Arianne A. "I moved to the area 3 years ago and immediately felt at home with Rachel and the IBY girls. It's very apparent that they are a group of women who not only care about their clients, but also about each other, which allows for the incredibly comforting and relaxing atmosphere. Rachel always does a great job with my hair and my eyebrows and we always have fun while she does it. She did my hair for my Thursday afternoon courthouse wedding and they all made me feel as special as every bride hopes to feel! I am filled with gratitude to Rachel, Erin, Danielle, and all of the IBY girls for all that you have done for me!" "Such an amazing group of women who take incledible care of their clients!" ~ Ruby J. "Warm, loving, and accepting atmosphere - All to the credit of Erin! She is truly the spirit of the place." ~ Dianne S.
"Everyone at IBY is genuinely friendly, fun and caring. It is a pleasure to spend time at this salon, never pretentious but very upscale and comfortable. Erin and the rest of the stylists are TOP NOTCH! From being greeted as you walk in to feeling beautiful and relaxed when you leave.... won't be disappointed!" ~ Kathy B. "Erin Cook...you ROCK!!! I have not had so many people compliment me on my hair in such a short amt of time!!! You truly have a talent! You are sooo accommodating & patient. The entire experience at the Studio is relaxing & enjoyable. Love my color, it is so pretty & vibrant. The cut is fabulous, too! Yippee!!" ~ Joanne E.
"Erin and her amazing team of stylists are tirelessly dedicated to helping their clients look great and--even more importantly--FEEL great, too! Stylists at this salon continue to develop genuine, caring relationships with their clients. Consequently, the staff always learns the most about a customer's unique needs and personal style. The stunning results will highlight each team member's professional talents. More so, it is the wholehearted connection to the person that connects these talents to real inner beauty. Visiting 'Inspired By You' is a priceless experience!" ~ Beth M.
If you would like to share your experience here at Inspired By You with our Guests and potential Guests, please take a moment to email us via our "Contact Us" form here on our website! We would be honored to publish your voice! Equally important, we would like to hear feedback if your experience fell short of your expecation of us! Please feel free to contact us as your satisfaction is very important to us! We thank you for your feedback in advance!